Living in Durham, I have to wait for WCPSS to cancel school. Then DPS will follow but never before. I checked the website and saw nothing. It is funny b/c my wife got ready for work and I went outside to clear the windows on the car and warm it up for her. I checked the street and was like oh no, you ain't going to work in this. There is at least 2 inches of ice. Long story short: her manager came and got her. Last thing I want to deal with is a car wreck and insurance next week on top of what I have on my plate. The main roads outside the neighborhood was in the same condition. In my part of Fuquay we have about an inch of ice on the ground. We are already seeing signficant meltage this morning from the sun and hope to see more this afternoon as temperatures nudge above freezing. Tomorrow morning will be a disaster on the roads due to re-freezing but I'm really hoping schools open up by Tuesday! I would say thursday would be the first day back. Say goodbye to the spring break this year. I always said I would never do it, but if this week causes a cut in spring break, I'll have to call my daughter out the week of spring break, as I've already planned a business/leisure trip for that week. The trip cannot be canceled. If your daughter goes to WCPSS, and they miss anymore school beyond Monday and a 2 hour delay on Tuesday, it WILL eat into spring break - Monday's makeup day for traditional schools is 2/15, after that it gets into spring break. She's in Chapel Hill schools, but I think the policy is something similar. Anyway, plans have already been set to make the trip for the whole week, so she could very well be missing two of the "inclement weather" make-up days. And that is the reality of life with county wide districts. This is what my CARY Street looks like right now. I don't believe any buses will be making it down here for a while. Just rec'd a WRAL email, Durham schools closed. No news on Wake County. 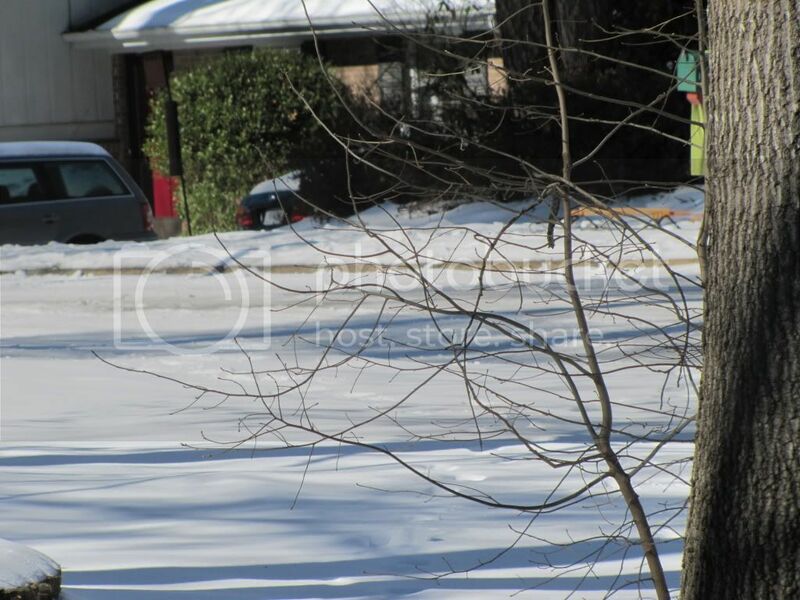 Northern Wake county received 6 inches. Roads are still solidly covered. I doubt kids will go to school all week.